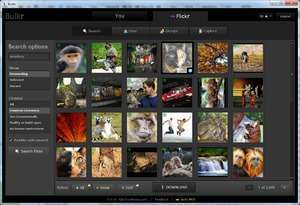 Bulkr is a free application for the Windows PC desktop (and Mac) which allows you to download multiple images at a time to your Flickr account. The freeware version has limited features. Upon running Bulkr, you are presented with an uncluttered and clean user interface which allows you to download photos, access your private photos and view your favorite photos and set albums in your Flickr account. Apart from viewing images and downloading them, Bulkr also includes a search feature which can sort the results in a number of ways including most recent, most relevant. For security reasons, you should also check out the Bulkr download at LO4D.com which includes virus and malware tests. Additional screenshots of this application download may be available, too.